Many homeowners want to open up access to their gardens by installing a patio door & by doing so allow much more natural light into the house whilst also creating the impression that the room is much larger. In terms of options there would be 3 popular designs such as French, sliding or tilt & slide. 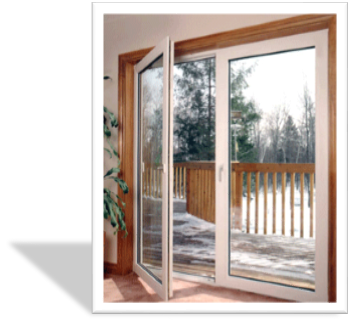 French Patio Doors are suited to the smaller openings (unless extra, fixed position, side panels are added), whereas sliding versions can cope with larger openings with ease simply by using more panels. Tilting versions offer maximum ventilation without having to fully open the door. As mentioned in previous descriptions, where 'floor to ceiling' fully glazed options are used in the home it is very important (and mandated by building regulations) to use safety glass such as toughened or laminated to protect the occupants from injury in the event the glass gets broken. With Tilt & Slide, the moving panel can tilt inwards for ventilation however, for safety reasons the amount that the windows can move (angle of tilting) we be limited by the hinges. With the installation being primarily composed of glass, managing energy efficiency & security could be a concern for some. Security can be addressed by the use of laminated glass, anti-lift tracks & secure multiple point locks, whilst energy (such as heat gain / loss) can be managed by utilising BRFC highly rated products that feature gas filled double or triple glazing and low emissivity glass.